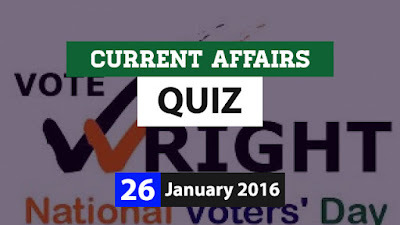 Hi Aspirants..Here is the objective Current Affairs Quiz for 26 January 2016. Trending topics for the day include National Voters’ Day, Malaysia Masters Grand Prix, Pandit Shankar Ghosh, National Girl Child Day etc. 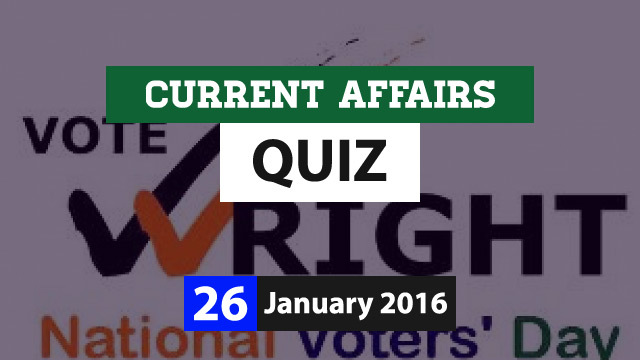 You can check further details while attempting the Quiz. Attempt the quiz and share your score. Q1. National Voters’ Day is celebrated across India on? Q2. What is the theme of National Voters’ Day 2016 observed on 25 Jan. 2016? Q3. The first Ministerial Meeting of Arab-India Cooperation Forum was recently held at Manama. Manama is the capital city of? Q4. Who recently won the 2016 Malaysia Masters Grand Prix Gold Badminton title? Q5. Pandit Shankar Ghosh who passed away on 25 January 2016 was a famous exponent in? Q6. Union cabinet headed by Prime Minister Narendra Modi on 24 Jan. 2016 has recommended imposition of President’s Rule in which state under Article 356 (1) of the Constitution? Q7. India’s largest tricolour was recently hoisted by Defence Minister Manohar Parrikar in which city? Q8. Which company has recently launched country’s first Social Mobile Wallet named Udio? Q9. Which country has topped in 2015 human development index (HDI) in the South Asia Region? Q10. National Girl Child Day is observed on?